When you dress do you ever think about the back view? I rarely consider it. 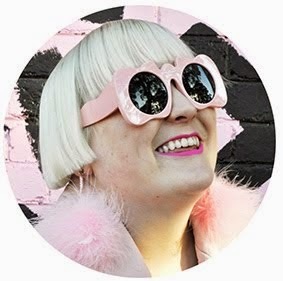 Henry has always said I dress only with my front view in mind, kinda like the "Superflat" art movement in Japan where their art is "flattened", my outfits are best viewed front on and are almost one dimensional, at least in my mind, hence I never take side view photo's. Anyway an LA based label, Laeken, has some very cool capes, jackets, dresses and coats for Fall/Winter 2009 which are obviously very Japanese inspired with their obi like bow details on the back of each garment. Maiko (Geisha in training) in Gion, Kyoto. Their Obi (belts) are tied into a square pillow shape not a bow. The bows seem to appear more on Yukata, otherwise known as "Summer Kimono" that people wear to Hanabi Matsuri (fireworks festivals). I love this photo, such a fun day in Kyoto with my sister. Photo at my old train station on my way to the most famous Hanabi in Tokyo, the Asakusa Hanabi over the Sumida river. 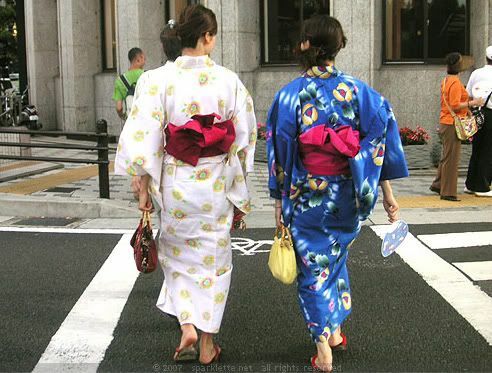 In summer lots of people wear Yukata. 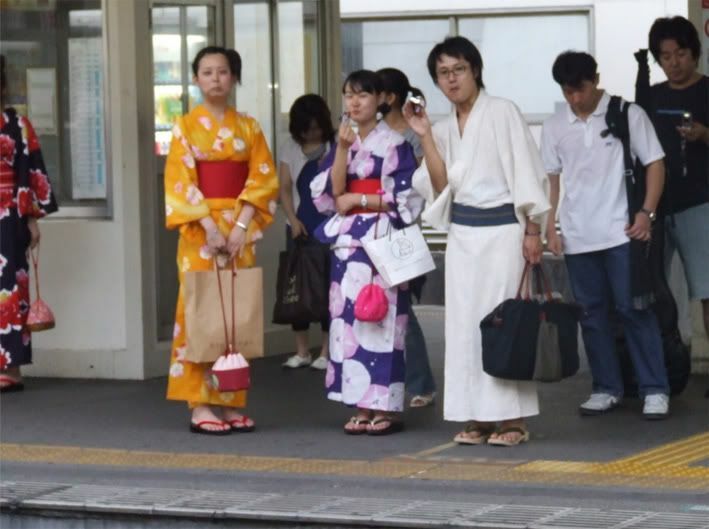 Heck at any time of the year you can find Japanese people in traditional dress. When we were just over there we saw a man in a business suit with some stilted Geta (traditional thong shoe) getting off our train. My sister thought it was hilarious, which I guess it was. 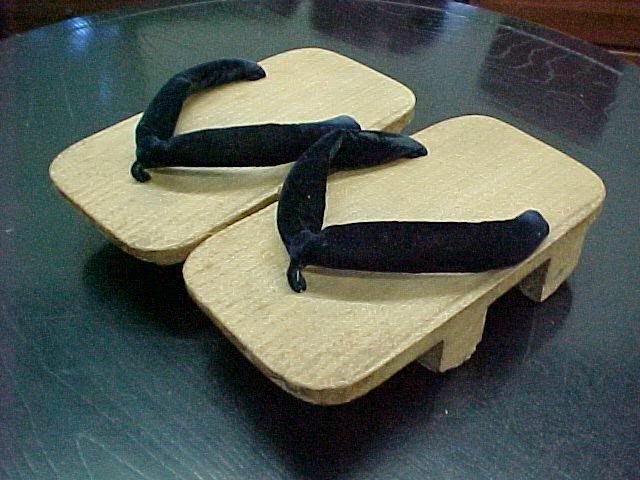 Did you know the stilted Geta were traditionally used for Mountain Climbing!?!?!?! Ahhh Japan you so crazy. Stilt style Geta. There are also 1 stilt in the middle style and higher stilts. The worlds first unisex high heel? Maybe that's why I saw so many fashion boys in Shibuya in Rick Owens-esque high heeled boots? 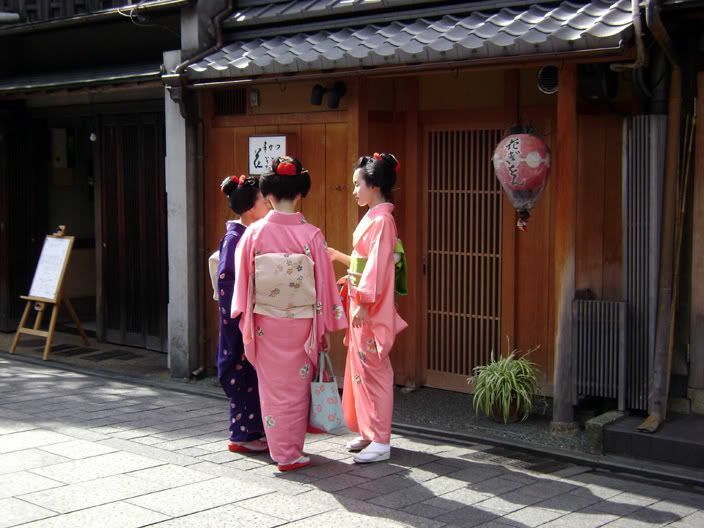 Women in the street wearing Yukata. Their bow's are the self tied variety. 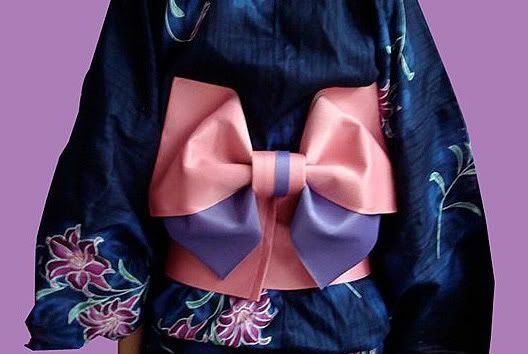 You can also buy pre tied bow obi's, which are more kawaii. I think I'm going to start making my own obi bow to wear. I think it will be so kawaii. Or maybe I will just buy that Laeken cape? OHH that first cape it devine! oh wow those second and third pictures are lovely! i want me a bow coat!! I never think about the back view either - I do have a skirt that has all kind of fancy origami style folding going on in the back but that's about it! i love that cape! and the last jacket too. yeah make your own obi...! how do you even do that though? i tried walking in those geta!! it's so fun! they make you walk really fast coz you are constantly tilting forwards. when i was younger and use to fuss about the back of my hair or my bum my nana always use to say "a good solider never looks behind" .... no idea what it means *lol*, but after awhile i didn't care :). 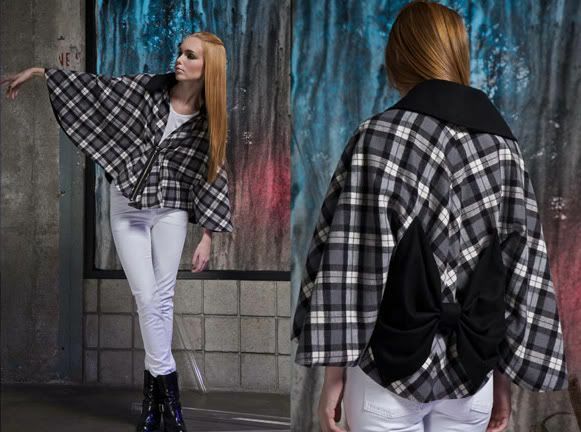 love love love bows at the moment and those capes ... just gorgeous! I love the cape. The bow is gorgeous! I'd love to see you style some Japanese inspired outfits of your own Hayley. Pretty please??? ahh, i absolutely love those bows! Thank you for taking the time to leave me a message but remember to play nice! © Powered by Hayley Hughes 2006 - 2015. Powered by Blogger.